School Visits. Authors do them; illustrators do them, should you? I would say, most definitely yes! Not only are they a wonderful way to let your audience know about you, your craft and your books, they are a great opportunity to learn about your audience and they are a great way to supplement your income. However, my favorite reason for doing school visits is to see how excited the kids and teachers get when you shown them your books and tell them about what you do. I come away from a school visit excited and inspired about what I do and eager to get back to work. That to me is worth more than anything. So what is involved with school visits? Well, I won’t sugar coat it, they are a lot of work and take quite a lot of preparation. How do you book a visit? What do you include in your presentation? How much should you charge? How do you tie into the school curriculum? There are countless questions that come to mind, especially if you have never prepared and presented a school visit before. Instead of writing up a huge long blog entry, I thought it best to provide some web resources from what I would call school visit experts. There is a lot of information on the web but I have found the following to be the upmost best on the subject. If you stumble across additional resource please send me the links as I am working on updating my website, where I am adding a section on school visit resources. This site is a great place if you have specific questions about school visits. The resource page has a long list of articles ranging from Nine Business Basics for School Visits, Promoting Your Availability, Shaping Your Presentation, and The Reluctant Presenter just to name a few. The award winning author Verla Kay, offers a wealth of information when it comes to writing in general and her website, which even has a message board, has twice been named one of the 101 Best Websites for Writers by Writer’s Digest. On Verla Kay’s Blog, she wrote an entire series of articles about school visits that are all a must read. There is a search feature on her blog. Just type in school visits and you’ll get a list of articles about the topic. If you are not familiar with “E” you have to check out both her website and blog. I would say that she is the one to follow when it comes to self-promotion and thinking outside the box. Check out her page on school visits, for great pointers and even a way on how to help your school get funding for the visits. “E” even presents her visits via Skype. 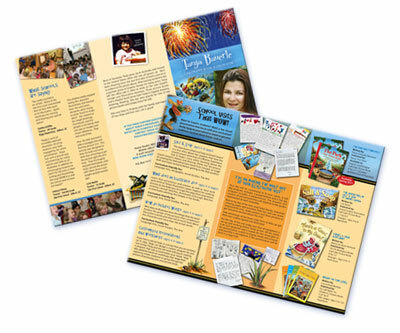 She has a wonderful Media section, featuring posters, brochures, and other things that are great for school visits. Her links page, features some great articles that she has written.